Posted by Jon in Funko, Review, Thundercats with 0 comments. Funko continues to build on their “Savage World” 5.5-inch action figure collective with the ThunderCats. Remember ThunderCats? That license that everyone seems to want, but just never quite takes off. Funko seems to have plans for the line, however. At least for two waves that are revealed on the back of the figures’ cards. I do have to admit, even as a child I’d always considered the ThunderCats a type of expanded universe to He-Man and MOTU. Which is why I think this license actually makes the most sense out of any that have been revealed thus far by Funko for the Savage World collection. Adding brand new figures to a vintage collection seemed like such a far-fetched idea only a few years back. 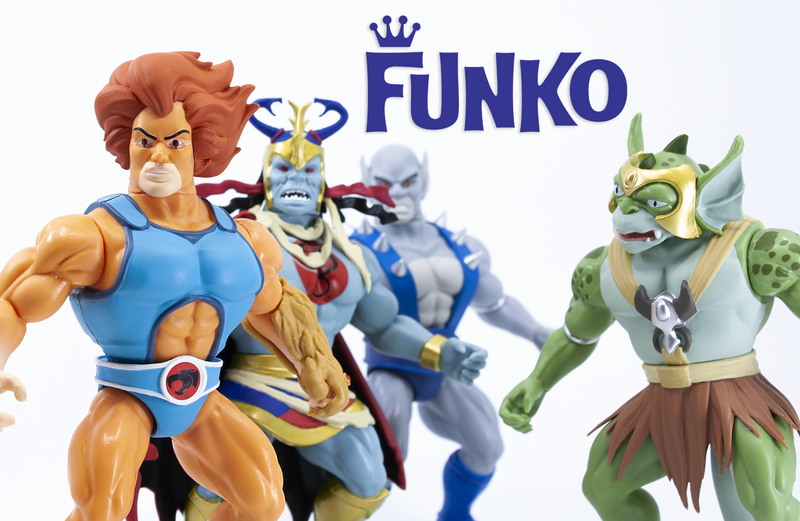 And here we are with 5.5-inch action figures of Lion-O, Panthro, Mumm-Ra, and Slithe. Each figure comes with one or two character-specific accessories. Lion-O includes his claw shield and the Sword of Omens. Panthor comes with his nunchucks. Mumm-ra carries his Sword of Plun-Darr. And finally, Slithe has an axe. These figures are made of very sturdy plastic, so some of the accessories need to be worked into their tight grip. For what Funko was going for with these figures, they are very impressive. The sculpts do a great job emulating the Remco/Mattel ‘Barbarian’ body style. The paints are vibrant and clean. And, what else can I say, it’s the Thunder-Thunder-Thunder-Thunder-Cats! Would I suggest Funko Savage Savage World ThunderCats Wave One? I don’t think this aesthetic is for everyone. However, if you are into the faux-vintage style 5.5-inch figure scene, then these should make you pretty happy. It’s a fun line, and at least from the card art, we’re guaranteed a good majority of the main cast. That’s more than can be said of Mattel’s ThunderCats Classics line which ended up meeting an early demise. These figures should be hitting Amazon and other retailers shortly. If you still want to get in a preorder in, check out Amazon or our sponsor Entertainment Earth.